Ship Weight : 37.8 lbs. 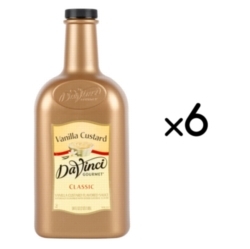 Satisfy sweet cravings with this sinful vanilla sauce from DaVinci Gourmet. Classic Vanilla Custard Sauce features the sweet, creamy taste of custard and plump vanilla beans. Contains rich whole milk and a touch of real butter for authentic custard flavor. Try in coffee, frappes, mochas and hot cocoa to add sweet vanilla flavor. Or mix into hot cocoa for a sweet twist. Drizzle over whipped cream-topped drinks or ice cream to enhance their creamy flavor. One case = 6 - 64oz bottles. For maximum convenience and perfect measuring every single time, we recommend 1oz sauce pumps, sold separately. $0.28 / oz. $0.27 / oz. $0.26 / oz. $0.23 / oz.